I finally got a look at sculptor David Adickes’ giant statues of the Beatles. 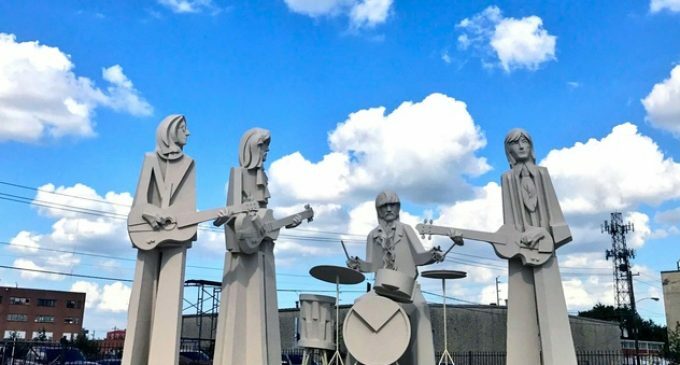 John, Paul, George, and Ringo, four tons per Beatle, stand in the backyard of 8th Wonder Brewery, located near downtown Houston.“We have an agreement for the Beatles statues to be here for at least one year,” said Ryan Soroka, “entrebrewneur” and president of the craft brewery. “We have plenty of room for them in our backyard. Like everyone, I grew up with the Beatles music, so I’m honored and happy to have them. People take photos with the statues. It’s pretty cool.”As part of the deal, Soroka had to pay for the statues to be disassembled and transported from Adickes’ property off I-10 to the brewery. John, Paul, and George each were delivered in three pieces, while the more elaborate Ringo sculpture arrived in five pieces because of his drum kit.While the concrete statues are set in stone at 8th Wonder Brewery for one year, they are for sale. All you need is love and $350,000 to buy all four moptops. The statues are not available separately. You can’t buy just Paul or John.Anybody want to lend me 350 large? 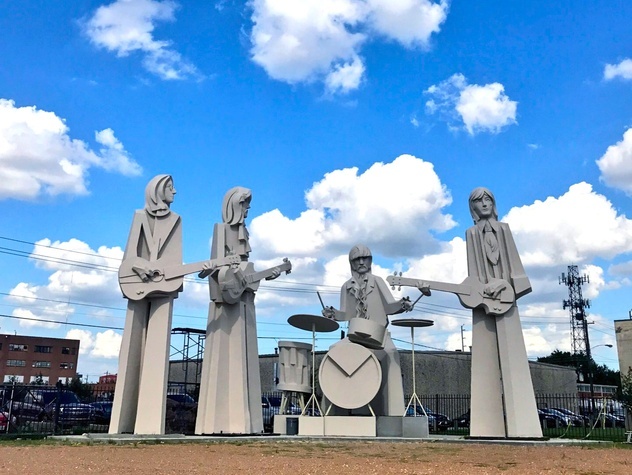 I would love to have these statues in my backyard, peering over the neighborhood from 36-feet high.Not to quibble, although I seem to have made a career of quibbling, I would insist on one thing: the Beatles statues would have to be repositioned. I understand artistic license, but Adickes has the Beatles standing, left to right, John, George, and Paul, with Ringo in the back.That’s just wrong. Adickes might as well create a statue of the Mona Lisa and put a pirate’s eye patch on her. I’ve spent way too much of my life happily watching Beatles concert and promotional videos. I have never seen them performing with John stage left and Paul stage right.From their earliest days at the Kaiserkeller in Hamburg to the Cavern Club in Liverpool to the Olympia Theatre in Paris to the Ed Sullivan Show in New York to the Hollywood Bowl in Los Angeles to the Sam Houston Coliseum in Houston to the Kungliga Tennishallen in Munich to the Budokan in Tokyo, it was Paul was on the left, John on the right, usually with George as Mister In-Between.That’s how I put the Beatles bobble heads on my desk. I respect history. The Beatles did not need my stage direction. The Beatles moved around onstage, sure. John would come over to share Paul’s microphone on “Baby’s in Black.” John, Paul, and George would huddle around one microphone for “This Boy.” John’s in the middle for the final Apple rooftop show. But there’s Paul on the left, always. John on the left, never. Maybe, as Larry David might say, John couldn’t go left.